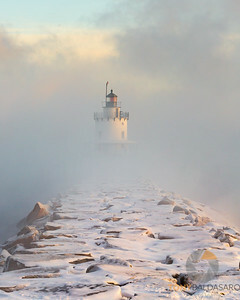 Images in the gallery include a variety of Lighthouses. 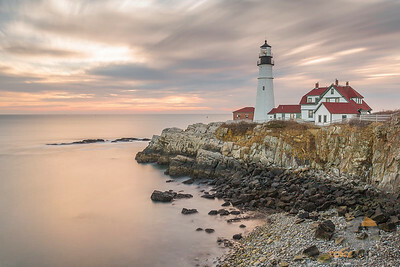 A long exposure captures the moving clouds and soft morning colors at Portland Head Light in Portland, ME. 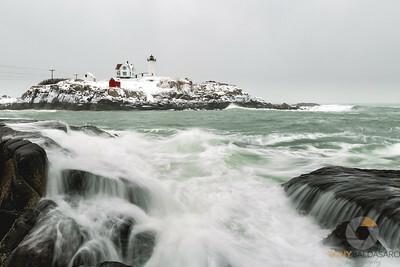 Easy access and the ability to get close to the water and stay dry to capture same wave action, makes Nubble Light in Maine a popular destination. 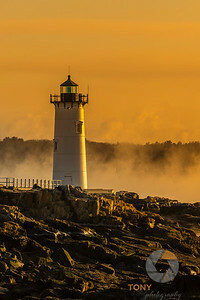 On this morning, a sliver of an opening allowed some sunlight to paint the underside of the clouds behind the lighthouse. 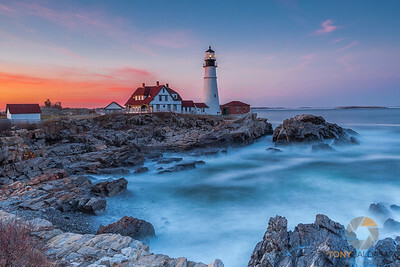 As the seas crashing into the rocks below, the majestic Portland Head Light stands guard over the entrance to Portland's harbor. 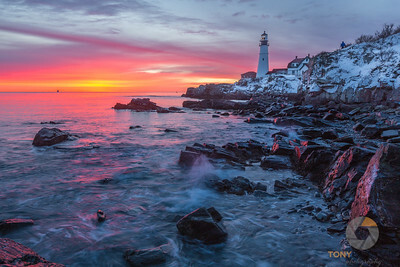 Marking the entrance to Portland Harbor, the Portland Headlight stand magestically over the cliffs in Fort Williams Park, Cape Elizabeth, ME. 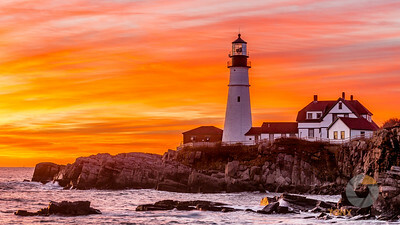 As the sun's first rays paint the clouds orange, the long time guardian of Portland Harbor, Portland Head Light, continues to stand tall along the cliffs. 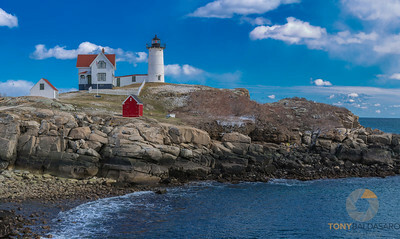 Cottonball type Cumulus clouds on the bluest of skies form the backdrop of the Nubble Lighthouse in Cape Neddick, ME. 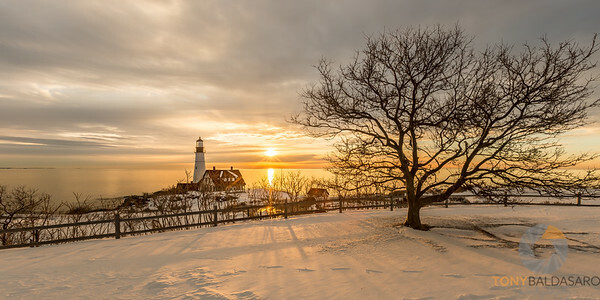 This is actually a 4 shot panorama taken on the day after a small spring snow storm hit the north east. 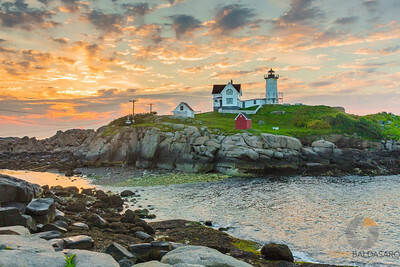 Fun fact: In 1874 President Rutherford B. Hayes apportioned $15,000 for the building of the Nubble Lighthouse. 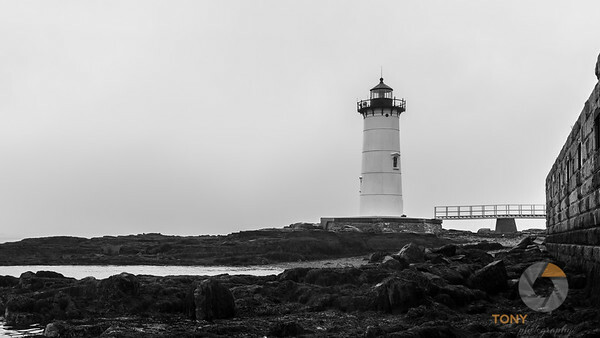 By July 1879, the construction of the ligthouse was complete. 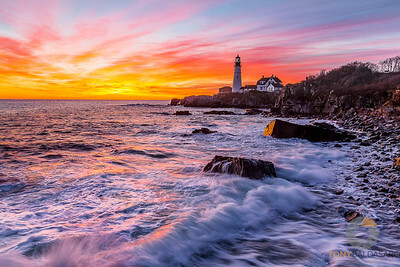 A long exposure of the waves crashing upon Portland Head Light as the sun sets over the city of Portland. 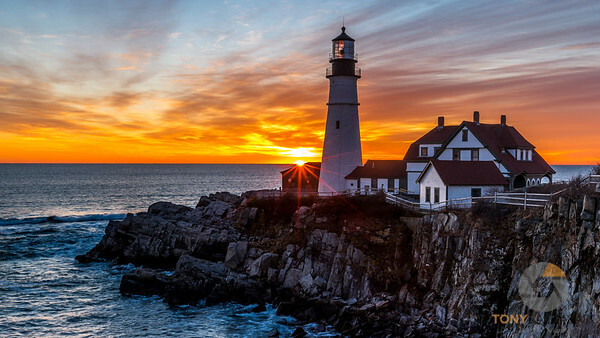 Fun Fact: Standing 101 feet above sea level, the light on Portland Head Light marks the entrance to Portland (ME) Harbor, the second largest oil-port on the East Coast of the United States. 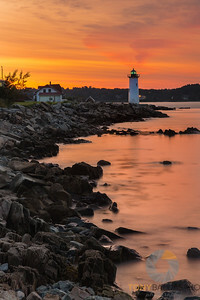 The rising sun casts an orange hue over the water surrounding the Portsmouth Headlight in Portsmouth Harbor. 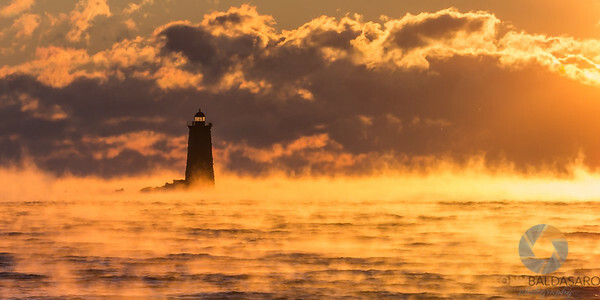 The first light of the morning reveal the lighthouse. 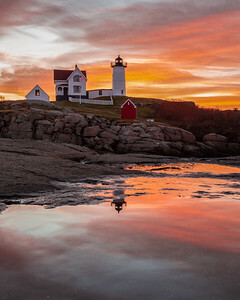 A puddle from the previous day's rains provided a nice reflection of the lighthouse and skies at Nubble Light. 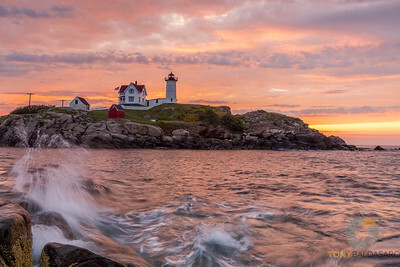 Beautiful light at sunrise at one of New England's most popular lighthouses, Nubble Light in Cape Neddick, ME. 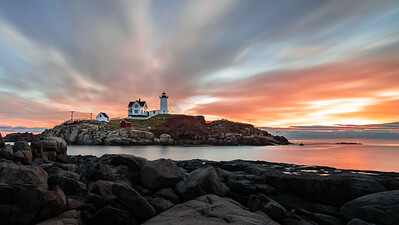 The sun broke through the clouds just enough to light up the side of Nubble Lighthouse on this chilly November morning. 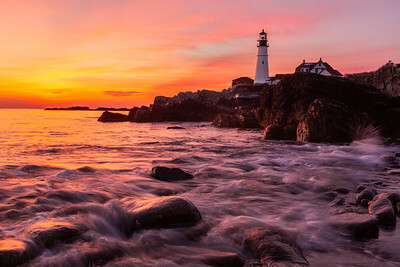 The low tide provided access to the lower portion of the boulder filled shore being washed by the incoming waves.